This bright floral romper is outfit you need for a spring/summer night! V neckline with button for added coverage. 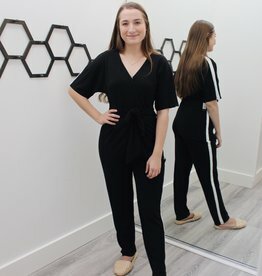 Super soft black and white jumpsuit! Added button along the v neckline allows for added coverage. White detailing along the sides of the jumpsuit! 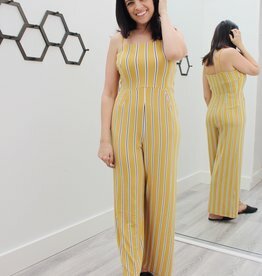 Say hi to the sunshine in this yellow jumpsuit! Made of 95% viscose and 5% spandex make this jumpsuit oh so soft! Deep V neckline, open back and fitted waist. Side cut-outs and wide-leg pants give it a relaxed but bold look! Whats not to love about red and gingham?! Comfy and stretchy romper with a tie at the front.